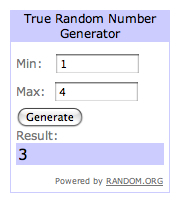 The winner of the “Crafturday” giveaway is …. CONGRATULATIONS! CHECK YOUR INBOX SHORTLY FOR DETAILS ON HOW TO RECEIVE YOUR ARMLET! Thanks. The Mrs. is proud of me.